The most impressive of all the Taccas (We say it the mots incredible plant on the planet). This monster can reach a height of over 1.75 m tall. The white flower bracts with deer purple lines can measure 30 cm across. The most amazing part is the many whiskers which can be more than 1 m long. 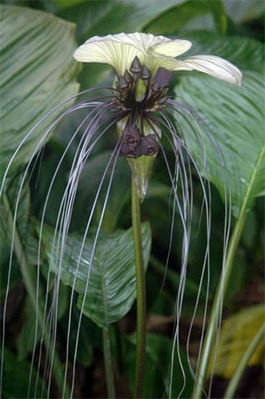 No wonder its called the “Devil’s Whiskers”. For all tropical and sub-tropical plant lovers with the space and the proper growing conditions this is a “must have” in your collection.